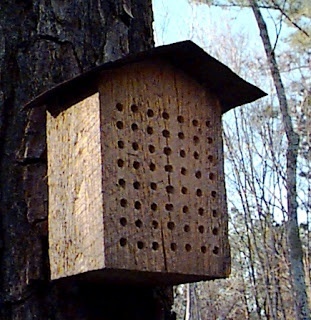 “Bee Houses” provide cover and places to raise young for bees. They’re easy and fun to make, or can be purchased commercially from several vendors. The Orchard Mason Bee is a wonderful little creature. It does not live in a nest like other bees; it lives in wooden blocks, but does not drill holes and destroy wooden items like other bees. It uses holes that are already available. The male Orchard Mason Bee can not sting and the female rarely stings. With drill bits of various sizes (5/16th of an inch works best for Mason bees) simply take some scrap lumber and drill holes 3 to 5 inches deep but not all the way through the wood block. For example, get a 4 inch by 4 inch piece of wood and drill holes that are 3 and 1/2 inches deep. You can cover the holes with chicken wire to help keep birds away from the bee house. Securely place the bee house on the South side of buildings, fence posts, or trees. Scatter some of the houses throughout your community. You may find an excellent location to trap some bees and then move them to your location if you get permission. DO NOT move bee houses after they are in place until at least November. DO NOT spray insecticides on or around bee houses. If you choose to build your own bee houses, DO NOT use treated wood. Be sure to be cautious of the use of insecticides around bees and especially during open bloom. Use products that are recommended, and during times that the bees will not suffer.